You’ve probably heard of Zoosk, but should you sign up for an account? Is the site any good, how many other people use it, what is their security like? Well, here we answer all those questions! We take a look at the site’s best features, how easy it is to sign up, and what a premium account will get you. Zoosk has a ton of great features that their existing users love, and we know that you’ll be no different! 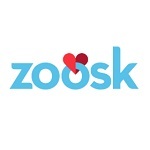 Have a look at our Zoosk South Africa review, and decide if it is right for you. 1. How Does Zoosk Work? 2. How Does Registration Work on Zoosk? 4. Can You Message on Zoosk for Free? How Does Zoosk South Africa Work? Zoosk is a dating site with 35 million members worldwide, in more than 80 countries and in 25 languages. Their dating app is also the most popular on the Apple App Store. Zoosk South Africa is ranked the number one dating app in South Africa - as well as the US, the UK, Canada and Australia. It even won a Webby Internet Award for its app in 2015! There’s a reason Zoosk South Africa is so popular. As well as an easy to use site and app, Zoosk’s Matchmaking system, SmartPick, learns from existing users’ behaviour to constantly improve its algorithms. The basic account is free, but if you wish to use some of the site’s more advanced features, you will need to become a paid member. Whether you want friendship, casual dating or something more serious, Zoosk South Africa can accommodate you. With dating being as exciting and diverse as it is today, the available services that you can find provided here will be sure to meet your needs. How Does Registration Work on Zoosk? Registration is really easy, and free! You can sign up direct on their site, through their app, or using your Facebook or Google account. To use the app, go to the store and download the app to your phone. Then simply open it and follow the prompts to begin registration. However you sign up, you’ll need to give an email address and tell them about your location so that they can find matches close to you. Just fill in a few basic details, and you’re ready to complete a quick personality test and start uploading photos. This will help Zoosk search for the most accurate matches for you, as well as verify your account. The best South African Dating Sites, check it out! Using Zoosk South Africa could not be easier in 2019. It gives you a step-by-step guide when you enter the site for the first time, which shows you how to view profiles and send messages. If you want the most out of the free account, you should definitely spend a few minutes filling in the My Bio section and uploading a few photos. This will help Zoosk search for better matches for you. Zoosk allows you to verify your photos, so that other users can see that your account is genuine. This works both ways - you can also see that another account belongs to a real person! When you go to Zoosk login my account, you’ll be shown any new messages that people have sent you. You can view any photo that a member has if you message with them, and you can watch a video or two if they have that available. You can also browse to see who’s online, or even play the hot-or-not game, Carousel! Can You Message on Zoosk for Free? The Instant Crush feature (for Premium members) lets you not just say yes to someone but tell them that you have a crush on them. You are five times more likely to get a reply when you do this! If there’s someone you really like, you can use Coins to send them a gift. Just go to their profile and click the ‘gift’ icon, and choose the one you want to send. If you really want the most out of the site, however, consider signing up for a minimal monthly subscription. This will give you access to even more amazing features. This way, you can see who’s viewed your profile, send and receive unlimited messages, and view more profiles so that their SmartPick feature can make more accurate matches. Both free and paid members can purchase Coins, which can be used for some features like sending Gifts or Boosting your profile. Zoosk also offer promo codes from time to time, so it’s worth looking out for those before you sign up as you may get some special perks! Zoosk review all their members’ profiles to make sure they’re genuine, and you can verify any photo or video to prove that they are real. If not, you can use the services Zoosk provides under their terms to contact them and report any fake profiles you may find. US military members are able to upload documentation to prove that their profiles are genuine, so if you are approached by someone claiming to be military you have a way to know for sure! Zoosk take scams very seriously, so if you are messaged by a profile that seems suspicious then do report it. This helps Zoosk review other profiles to ensure that no-one gets scammed. Their customer service is accessible via email or through their FAQ, and they are easy to get hold of, helpful and friendly. If you have any questions or problems they are only a message away. The site will encrypt all your information so as to guarantee your privacy and the security of your details, so that only your verification will allow you to see them. Zoosk reviews all profiles before they are published. This includes looking at any photo used and any video uploaded, as per their terms. Zoosk also has a Hide and Seek feature on the website for Premium members the service allows you to Hide, only allowing people you message to see your profile. Seeking makes you fully visible. It’s easy to delete Zoosk account, simply login to the site on desktop and go to Account Settings. From here, go to Account Status and click Edit, then select Deactivate or Pause. Note that you can only delete Zoosk account from the desktop, not from mobile. You can only Pause your account from here. If you want to deactivate your account, then remember to cancel any paid subscriptions first! If you just want to take a break from dating for a while, then select Pause instead of Deactivate My Account. Just make sure to check the verification of the 2019 policy on Zoosk's website to confirm that you won't be pestered by any unwanted messages while you are paused. Don't like Zoosk? Try with Elite Singles and read the review.